Now just because summer is almost over (or if you’re reading this at some point in the year where this statement doesn’t make sense, then ignore it), doesn’t mean you should forget about fitness. The holidays are coming, you have to make sure that you’re not caught by surprise after New Year’s when you step on the scales. Oh, who am I kidding, none of us are surprised; we all know what’s coming after eating a turkey and couple of cheesecakes. But the point still stands! You’ve gotta keep your weight down so you can feel and look healthy! And what better way to do it than with some lazy exercises. And by lazy I mean short workouts that won’t cause you to give up on exercising all together (because those are the best). So check out the awesome exercises down below and let me know what you think! We all know that songs make it easier to workout; they get us pumped up and ready to go. And Buzzfeed’s 10 minute/3 song workout shows you what songs to exercise to and feel the burn.. but not for very long of course. Now talk about lazy, this is an exercise that can get your heart rate up, but not make you sweat too much. Pretty easy right? For just five minutes, you can get a full-body workout and feel a bit of a burn without getting angry at the fact that you’re working out and you don’t like working out. It’s enough to burn some calories, but not enough to ruin the rest of your week with an achy body. Ok so this one is 15-minutes, but it’s definitely not a 30-minute workout right? Those are just torture. The best part about this exercise is that you can burn some major calories, but also take some rests in between. It’s pretty simple and allows some muscle gain to happen. Quick and easy, this is a great workout so you can lose those extra couple of pounds. No need for that muffin top to stick around. If you wanna get those legs and glutes a good lift and get rid of some cellulite, then this super easy and low-impact workout is just for you. Now if you want to get some serious muscle action going on down there, then try this one out. Super simple and.. well lazy. More lower-body workouts! But I don’t know about doing it from anywhere. I mean if I started doing this in an airport, I’m pretty sure I’d get some weird looks. Now for the abs! If you have a little bit of pudge (love handles) on your stomach, then this is the perfect easy (lazy) exercise to do. Now if you’re looking for ways to lose weight, but don’t really like working out, then these are perfect for you. Besides, we always get motivated to get healthier, workout at the gym intensely, and then the next day regret it because our body aches…. and then we don’t workout for another 6 months. But if you start off slow, you’ll gradually be able to do more and you’ll feel so much better. 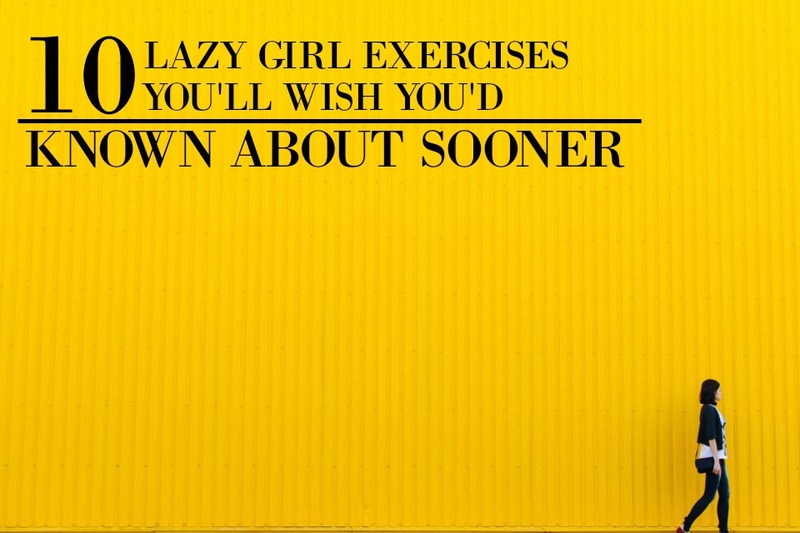 Now if you have any lazy girl exercises yourself, let me know in the comments down below, I’d love to hear about them! Also, check out this post that explains how to stay fit while traveling! Hey Amanda, I’m so sorry I got to your comment late! I’ve been so busy of late! Thanks you very much, this is wonderful!